Seven Days writers can't possibly read, much less review, all the books that arrive in a steady stream by post, email and, in one memorable case, an orchestra of crickets. So this monthly feature is our way of introducing you to five books by Vermont authors. To do that, we contextualize each book just a little and quote a single representative sentence from, yes, page 32. It had a monastic feeling that appealed to Virginia very much, and she was aware that when she pictured Robert's face when he discovered it, she felt real pleasure. As she sells off all but the largest pieces of furniture in the house, Virginia, the divorcing protagonist of the short story "In a House by the River," rediscovers a sense of self. In "They Shout Praises," a man gains insight into his troubled relationship while photographing a wedding. "Black Bears" evocatively charts a woman's life and her losses from childhood to middle age — in nine pages. In these and other stories, journalist and award-winning author Rickey Gard Diamond deftly captivates the reader with subtle plot progressions and complex characters who grow in poignant and unexpected ways. Reading them is like stepping into a theater smack-dab in the middle of a great play. Diamond has honed her craft for decades through short stories published in literary and feminist journals, through her novel Second Sight, and as founding editor of Vermont Woman. In this collection of previously published work, her skill and wisdom shine. Janet Hubbard, Poisoned Pen Press, 230 pages. $15.95. Juliette smiled at her daughter's exaggerated expression of bliss upon her first sampling of the tart. In the third and final installment of Fayston resident Janet Hubbard's Vengeance in the Vineyard mystery series, protagonist Max Maguire finds herself in France once again. 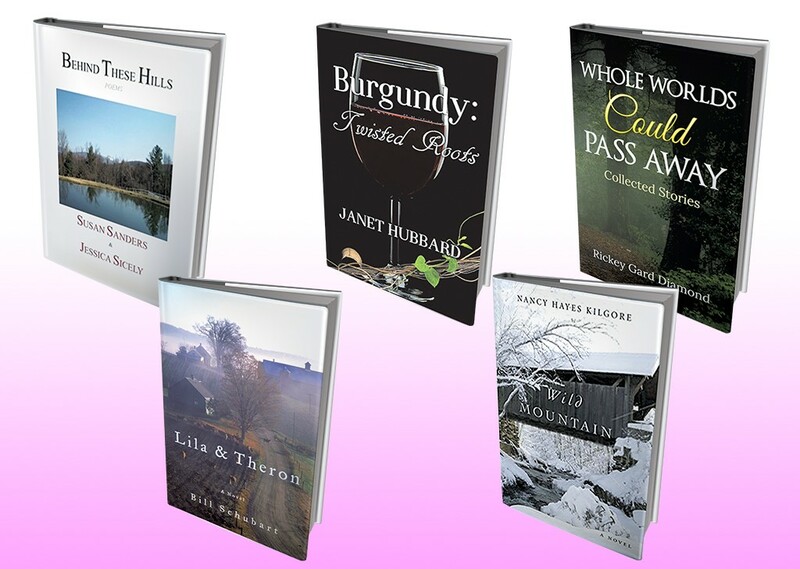 Each book in the trilogy has Max solving a murder in a different region of the country, giving our protagonist, and the reader, a tour of its lauded wines. Burgundy explores the New York Police Department investigator's exploits as she navigates a new death, a mysterious stranger, her engagement to a French magistrate, the region's wines and France's convoluted inheritance laws. Crack open a bottle of the book's namesake vin — it will make this quick read all the better. Hubbard launches the book on Tuesday, September 5, 5:30 p.m., at Big Picture Theater in Waitsfield. Nancy Hayes Kilgore, Green Writers Press, 334 pages. $19.95. Frank MacFarland was someone who didn't shrink from danger, who forged ahead when forging ahead was called for, whose heart went out to anyone in distress, and who fought for the underdog. This second novel from psychotherapist and former pastor Nancy Hayes Kilgore encapsulates the clash of old and new Vermont with a story set in 2008, at the height of the marriage-equality debate. The plot pivots around the slow-burn midlife romance of underdog-defending Frank, an ex-hippie from New York; and small-town general store owner Mona, left wary by an abusive marriage. After an ice jam sweeps away Mona's beloved covered bridge, she and Frank rally to replace it, even as conservative selectboard members muster their forces to expel a vocal lesbian. Presenting small-town life with strong descriptive prose and empathy, Kilgore eventually arrives at a heartening message of reconciliation. Kilgore reads from Wild Mountain with other Green Writers Press authors on Tuesday, September 19, 7 p.m., at Phoenix Books Burlington, $3; and on Thursday, September 28, 6:30 p.m., at Phoenix Books Rutland, free. Susan Sanders and Jessica Sicely, Createspace Independent Publishing Platform, 84 pages. $10. I am going on my own all alone, it may be worse in some ways, but I know it will be better. This collection of poems is strange in more than one way. First, the younger of the two poets is dead. Second, that person is the daughter of the other poet. Third, the introduction directly addresses the motivations and emotional impacts of suicide. In an author's preface, Susan Sanders describes her daughter Jessica Sicely's slow decline following a move from Arizona to Vermont. She closes it with a powerful sentence: "Two weeks later, Jessica shot herself in the woods on her grandparents' property." That sentence is compelling in its rarity. Rather than speaking bluntly about suicide, many occlude reality with idioms such as "she passed" and sentiments like "he's in a better place." The fruit of a decade of Sanders' processing, this collection is a lyrical attempt to speak honestly about a difficult subject. Sicely's accounts of her pain are stark. But there are glimmers of hope, as in the short poem that closes the book: "Above all clouds, / far beyond / our thoughts / we think of / that man upstairs / in an everlasting world of love. / When you ask / and find him / he covers / what lies inside. / Our purpose is to dream / in the hidden corner / of his heart." Bill Schubart, Charles Michael Publishing, 192 pages. $19.95. To many children, this independence is a blessing; but Theron, already orphaned once, feels more alone. Clearly, Hinesburg's Bill Schubart hasn't kept quite busy enough offering commentary on Vermont Public Radio and serving on the boards of numerous local cultural organizations (including the Vermont Arts Council). In the past nine years, he's also produced seven books, among them two collections of stories from his Lamoille County childhood. Schubart returns to that turf in this slim novel that chronicles the lengthy marriage of a modest dairy farming couple, born around the turn of the 20th century. Theron comes from a household of sorrow: His mother died giving birth to him at 19, leaving his father a broken alcoholic. No wonder he gravitates to the levelheaded Lila, who helps him milk cows on his ancestral land until the mechanization of the dairy industry forces them to sell off their herd. In the interim, not much happens, but that's the point. A memorial to lost ways of life, the narrative can occasionally get preachy, but, at its strongest, when Schubart focuses on his grounded characters, the book might remind readers of Gustave Flaubert's "A Simple Heart." And we defy anyone not to get misty at the end.